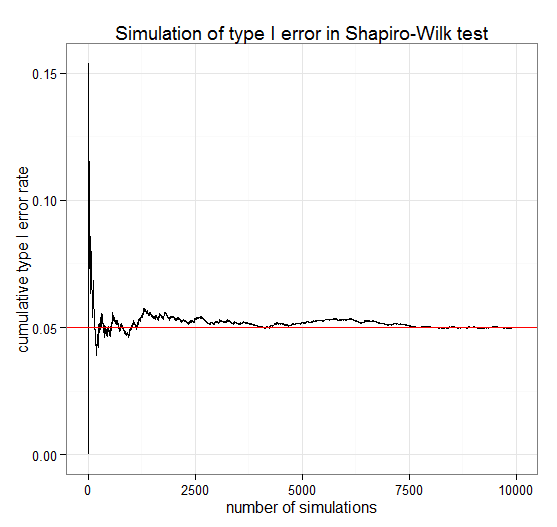 This simulation tests the type I error rates of the Shapiro-Wilk test of normality in R and SAS. First, we run a simulation in R. Notice the simulation is vectorized: there are no “for” loops that clutter the code and slow the simulation. As the number of simulations increases, the type I error rate approaches alpha. Try it in R with any value of alpha and any number of observations per simulation. Likewise, we now do a similar simulation of the Shapiro-Wilk test in SAS. The only issue is, without capturing ODS, I do not see how to get the p-value for the Shapiro-Wilk test, so if you want to modify the number of observations in each simulation, you must adjust the critical value for the test statistic W. Also notice there are no macro loops: the simulation is simpler and faster using a BY statement. In my SAS simulation the type I error rate was 5.21%. Tested with R 3.0.2 and SAS 9.3 on Windows 7.